With its rich and diverse culture, Rajasthan has long been known for its colourful arts and crafts. Centuries of tradition and history have been captured in the exquisite wares you'll come across in the streets and bazaars of this magnificent land. From jewellery to hand-woven sarees to paintings to pottery, there's so much more than just memories to take back with you when you visit Rajasthan. Renowned for its jewellery industry, Rajasthan is one of the world's largest centres for hand-cutting gems. It is also known for its spectacular variety of gold and silver jewellery. Every region in Rajasthan has its unique style and there's something to cater to everyone's tastes. Jaipur in particular, is famous for the Kundan and Meenakari styles of jewellery making, while Pratapgarh's unique style, which involves gold work on glass, is referred to as 'thewa'. 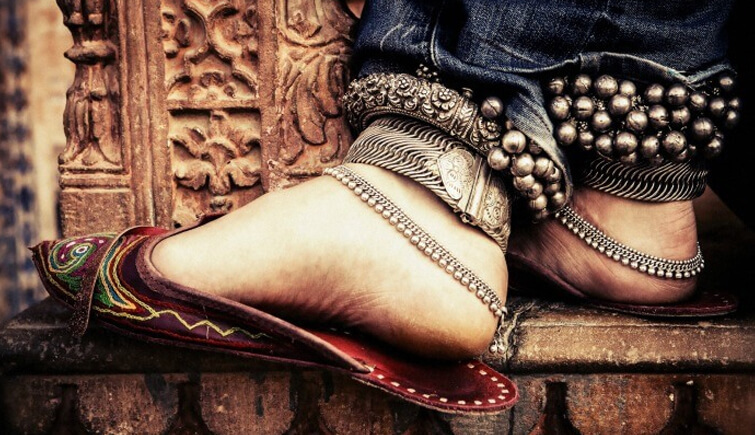 So whether you're looking for rustic jewellery or something more regal, gold and silver or even precious stones, Rajasthan is truly a gem of a place for jewellery shopping. The skilled cobblers of Rajasthan craft a number of exquisite leather articles including juttis and mojaris (types of traditional shoes), chairs, musical instruments, etc. The juttis in particular are a nice collectible as the styles differ from region to region. There is a lot of skill involved in crafting these shoes and they go through a number of processes. Visit Jaipur, Jodhpur, Barmer and Jaisalmer for juttis and musical instruments made out of leather. 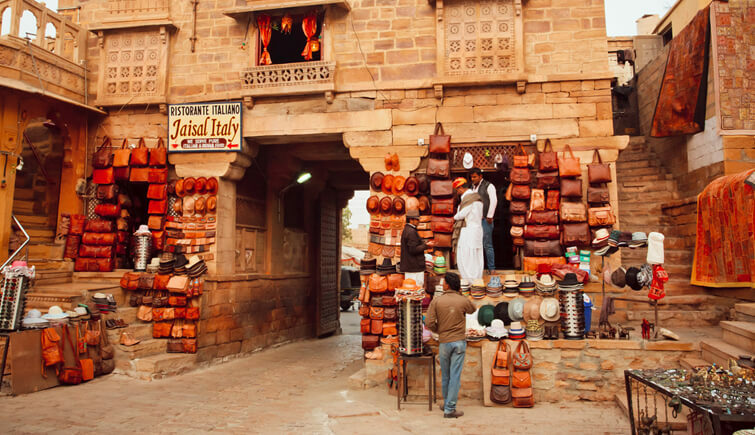 Bikaner is the place to be if you'd like to purchase lamp shades, shields, vases and mojaris made out of camel hide. Most of the landscape of Rajasthan is dry and arid desert, but there are a few pockets of lush jungle around Jaipur, Banswara, Kota and Udaipur which provide quality wood for craftsmen to create wooden articles. The furniture in particular is of special interest to those looking for antiques. Besides furniture, you'll also find a number of articles including toys, snuff boxes, chests, animal figurines and other interesting memorabilia. Famous for the leather products such as suitcases, leather shoes, and bags, the Kedal Ganj is one of the popular marketplaces in Pushkar. 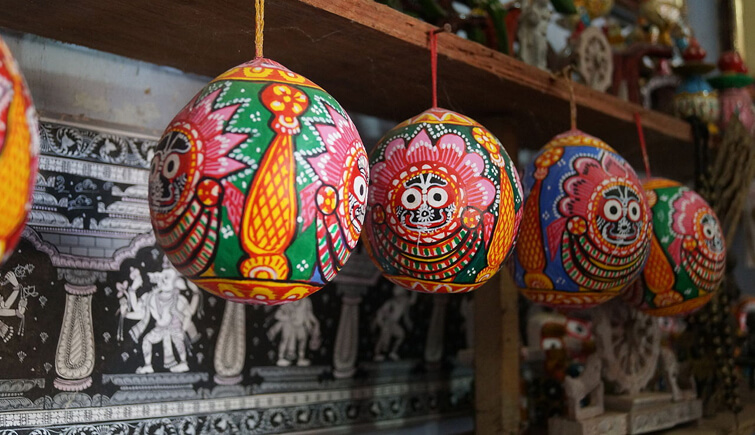 Here, you get a wide variety of shopping options like miniature art goods, wall hangings, and paintings as well as attractive embroidered dresses especially handcrafted by the local women. At Kedal Ganj Bazaar, you are for sure to enjoy shopping experience and buy great souvenir for your friends and family. 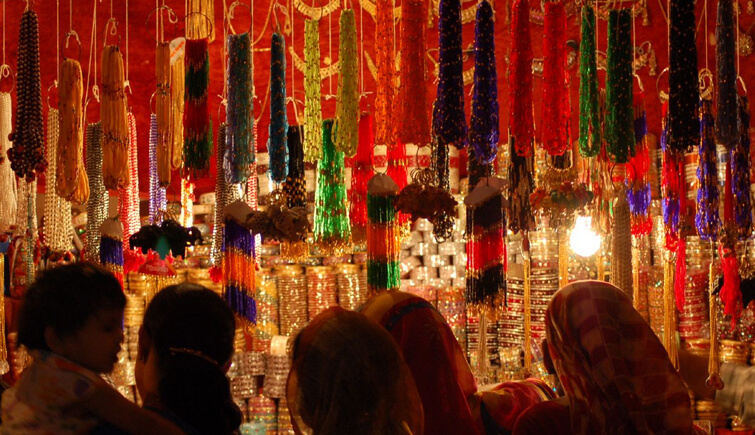 Pansari Bazaar is the oldest market in Jaisalmer and it is here you can explore true Rajasthani culture. Form the variety of traditional items sold such as ethnic wear and soft camel leather footwear known as mojari, you can also find colourful puppets and a wide collection of wall hangings. In fact, the markets loud yet pleasing sound and smell of food around every corner will also help you enjoy shopping experience in Pansari Bazaar. 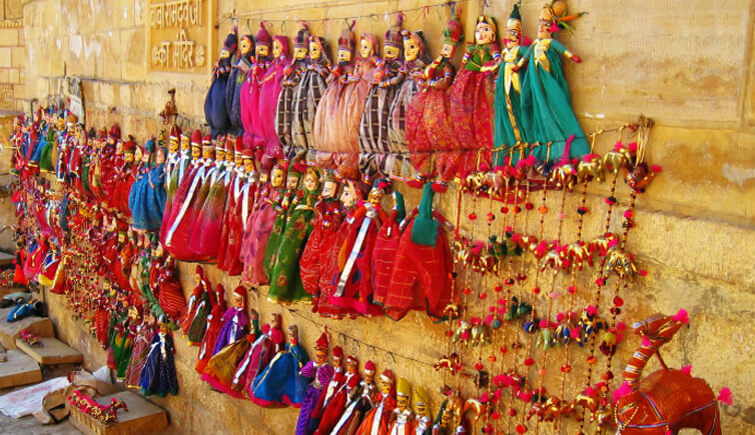 And one item that is a must buy and perhaps can make a perfect souvenir is the colourful Rajasthani puppets. Sarafa Bazaar is a vibrant marketplace in Pushkar and it exhibits the cultural and traditional items such as miniature idols and statues made of glass. Besides, you are for sure to find a series of beautifully handcrafted artworks and wall hangings. 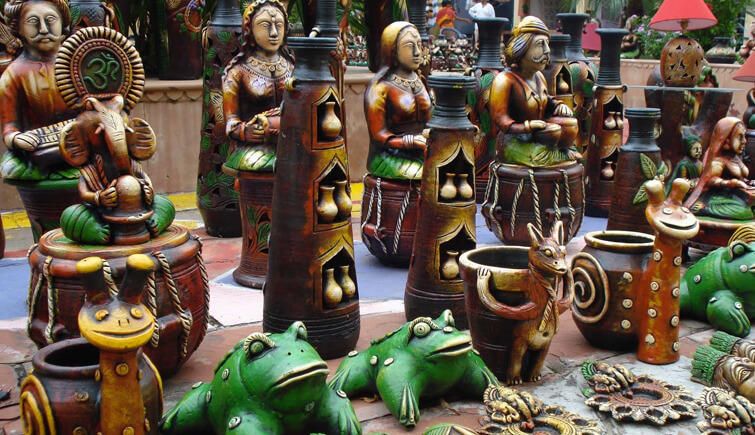 this market is an ideal place to shop for handicrafts items. Here, make sure to bargain as much as you can because the vendors tend to hike the prices slightly higher. 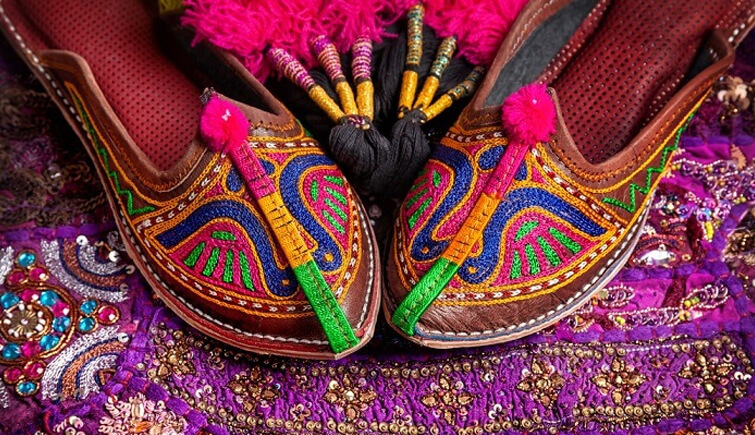 Mochi Bazaar simply means Cobblers Market in India and here you can expect to find all sorts of Rajasthani traditional footwear like Jodhpuri juttis, locally known as mojaris. However, when you visit this place you won’t leave with just a shoe in your bag, in fact, Mochi Bazaar also has a bunch of other accessories. For men, besides the famous mojaris, you can find sherwanis and achkans and perhaps for women who like the bling-bling, you can buy some varieties of lacquer bangles.